Dilmah, a Sri Lankan family tea company, with a market presence in over a hundred countries, announced its complete carbon neutral status for its products, early this year. The inauguration of two mini-hydropower stations at Dilmah’s tea estate in Queensberry and Craighead will commemorate the company’s voyage into becoming a complete carbon neutral product. With a capacity to generate a total of 1.5 million units of electricity each year, the two hydropower stations will contribute towards the company’s carbon neutral journey- making it yet another innovative venture in Dilmah’s commitment to the environment and sustainability. 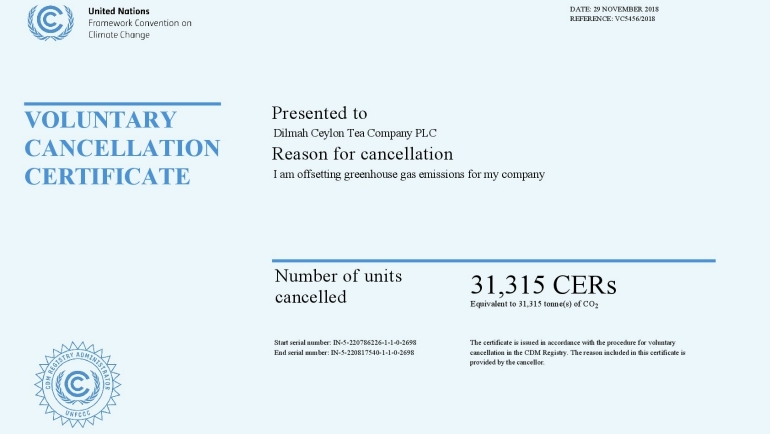 The Carbon calculation takes into account the carbon dioxide emissions starting at the point where the tea leaves are grown, plucked, processed, transported and packed, until it leaves the company’s premises, in accordance with Green House Gas Protocol, developed by World Resource Institute (WRI) and World Business Council for Sustainable Development (WBCSD). 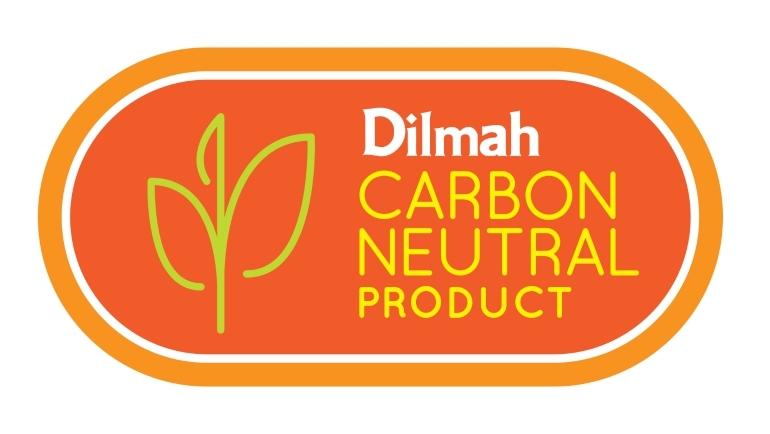 Thus starting 2019, the complete range of Dilmah’s products will be carbon neutral, bringing to its consumers a tea brand that is environment-friendly, and that is truly committed to the values of taste, goodness and purpose. Dilmah which is driven by a philosophy of making business a matter of human service initiated a unique reforestation project was started early last year to create a nature corridor. Founder, Merrill J. Fernando, uprooted the tea plants at the hundred-year-old Endana tea garden to connect 24 ha of fragmented forests across the tea estate, dedicating Dilmah’s tea lands to the preservation of endangered biological wealth found in the neighbouring landscapes. The initiative is among the many projects pioneered by Dilmah, that integrates environmental and biodiversity conservation, long-term efficacy in limiting greenhouse gases, and sustainability. Another fine example is the 1 Million Cashew Trees, ‘Greening Batticaloa’ project in Eastern Sri Lanka which was started as an immediate response unmanaged deforestation, loss of forest cover in the region and as a livelihood opportunity for the local communities. With 750,000 plants already been planted, and only a few thousand trees remaining to reach the targeted 1 million cashew plants, the project is expected to generate a revenue of 1 BN LKR every year from the cashew harvest even if only half the trees attain maturity. Dilmah also looks towards new avenues of increasing resource and energy efficiency through research and development projects, in an effort to reduce its carbon footprint. Early in 2017, Dilmah Conservation conducted a trial project on solar heat collectors to reduce the consumption of firewood in the tea drying process. Similarly, the organization designed and tested an innovative firewood dryer which demonstrated the potential to decrease the firewood usage in the production of tea by 20%, inadvertently helping in saving 35 trees each month. Dilmah is also applying biochar at its tea fields, to rejuvenate the agricultural lands and also to help in carbon sequestration. Besides this, the organization has also established a facility to convert the excess from the tea manufacturing process into biochar, in an effort to reduce the emissions generated from waste. As a company committed to reducing its carbon footprint, Dilmah established a climate change research centre, the first by a private sector entity to research climate change and look for long-term innovative and climate-smart solutions for agriculture to address the growing concerns of climate change. Dilmah also conducts awareness programmes on a range of subjects such as biodiversity, sustainability and climate change to inspire the younger generation to take more proactive actions in response to the upcoming national and global challenges. Dilmah which has always advocated the strengthening of stakeholder networks for more sustainable and long-term conservation initiatives is among the initiating partners that shaped Biodiversity Sri Lanka, along with IUCN Sri Lanka and Ceylon Chamber of Commerce. In 2017, a landmark multi-sectoral initiative- the ‘LIFE project’ by Biodiversity Sri Lanka, brought together ten leading private sector companies, including Dilmah, to restore the highly degraded rainforest in the Kanneliya Forest Reserve. Dilmah takes proactive measures to reduce its carbon footprint, by improving energy and resource efficiency through the implementation of innovative schemes, adding to renewable energy sources and regularly conducting internal training and awareness programs- as each member has an equal and large role to ensure the company’s sustainable ventures. Through its continuous efforts to address national environmental concerns and climate change, Dilmah has set a remarkable example in Sri Lanka’s corporate sector. 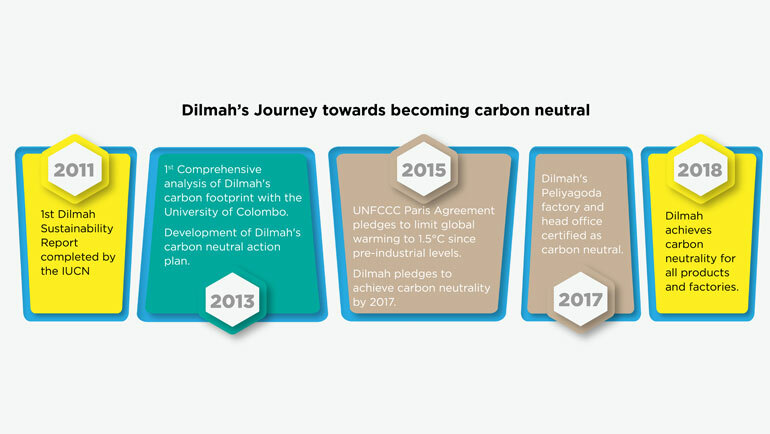 Dilmah’s Carbon Neutral journey thus echoes the tea company’s core commitment to environmental sustainability and its commitment to ensuring that all of their operations will be bound by a respectful and sustainable interaction with the environment.